Peridot is a transparent green variety of the mineral olivine that is used as a popular gemstone. It is the birthstone for August and its use in jewelry dates back to the Egyptian pharaohs. It ranges in color from yellowish green to dark lime green. It is found throughout the world but the largest known deposit of gem quality stones is in the United States on the San Carlos Apache Reservation in Arizona. Peridot is both a day stone and a night stone, keeping its shining color even under artificial lighting. For this reason, it is sometimes called “Evening Emerald”. Although Peridot can be pronounced both with and without the “t” at the end, most professionals in the gem trade pronounce the “t”. What is a Cigar Band Ring? The term ‘cigar band’ refers to a type of ring that has a wide, ribbon-like band, much like the paper band on a cigar. We here at Horsekeeping LLC, home of Native American Jewelry, vintage Dooney & Bourke handbags and Cherry Hill horse books, never have sales. BUT, each week I go through one of our many many departments and mark down from 2-6 items. For example, this week it was size 6 pawn rings. To make room on that page, I found four rings that I took $20-40 off. Here they are. 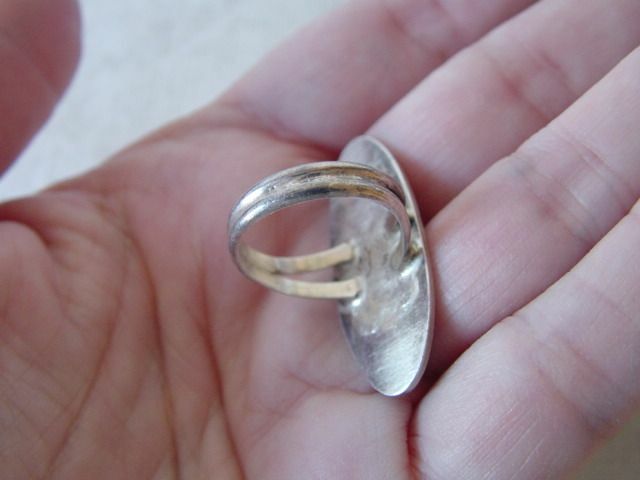 Can I wear this inlay ring to do dishes and shower without worry? No, you would have to worry big time. Inlay items are made of many small pieces of stone and shell that are affixed to a backing and to each other. Getting inlay wet such as in a dishpan or shower would allow water to get under the inlay and loosen it. It is NOT a good idea. Inlay, properly cared for, will last decades as shown by the many wonderful pawn and estate lot pieces we receive. But any inlay, old or new, should be treated with respect and common sense. 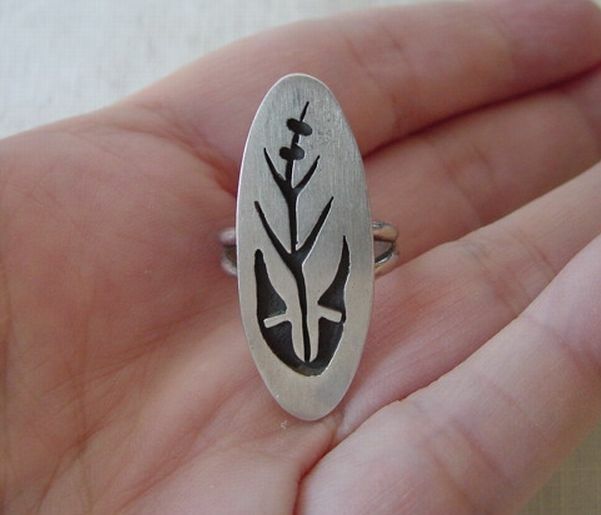 What kind of plant it on this ring and is it Hopi? Hello Paula! First I would like to say I really love your site, I come to it often for info! I have obtained this nice ring I believe is Hopi overlay. My question is what is it? I don’t think it is corn, but is obviously a plant. I can’t find this symbol in order to identify it. Also, it is hallmarked “YZR” which does show in my photo. I’m trying to identify the maker. Thanks in advance for any info you can provide! From the photo you sent, I don’t think it is Hopi, although it is the shape of many Hopi rings I have seen. You can read about the characteristics of Hopi and Navajo overlay here. From the photo of the back, I do not see the hallmark. I do have record of a YZ and a Y&R hallmark but no YZR. If you can send a better photo, I will dig deeper. As far as the plant, it is probably a stylized corn plant.